Not too long ago, three new Gateways were illuminated in The District , the culmination of years of planning. (You can read up on the project here.) As part of the public input process, one suggestion offered was a roundabout in the middle of Broadway featuring a statue of Daniel Boone. Although interesting from both a historical and a traffic management perspective, we wanted our Gateways to be something more than a statue in a park. I spoke with Lyz Crane, of ArtPlace America, at the beginning of The District’s planning process for the Gateways project. 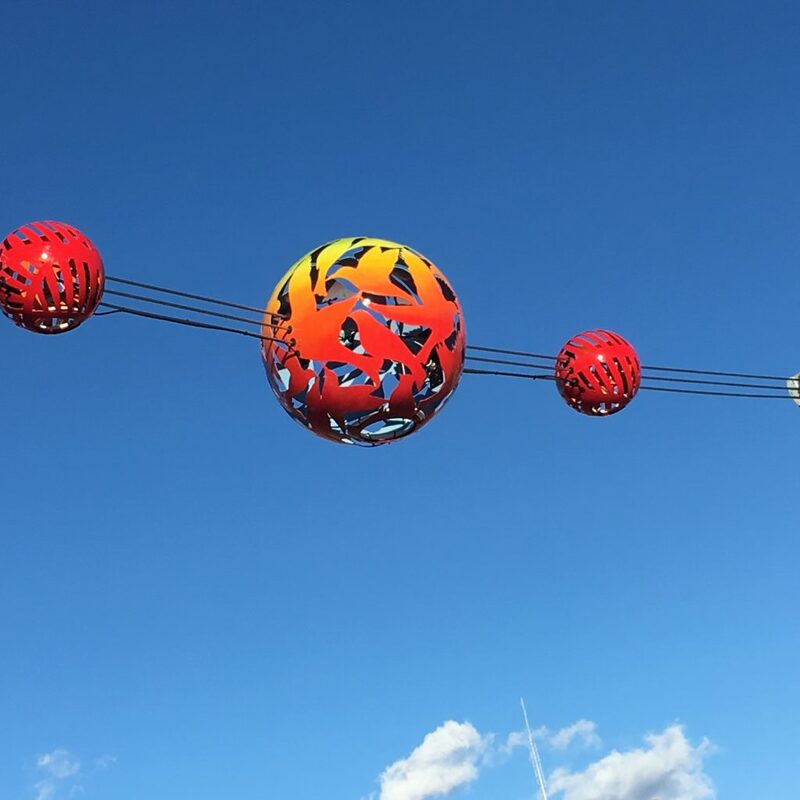 ArtPlace America funds arts-based projects that “help strengthen the social, physical, and economic fabric of communities,” and Lyz stressed that public art should be about connections — opening up pathways between geographical areas, groups of people, and differing points of view. 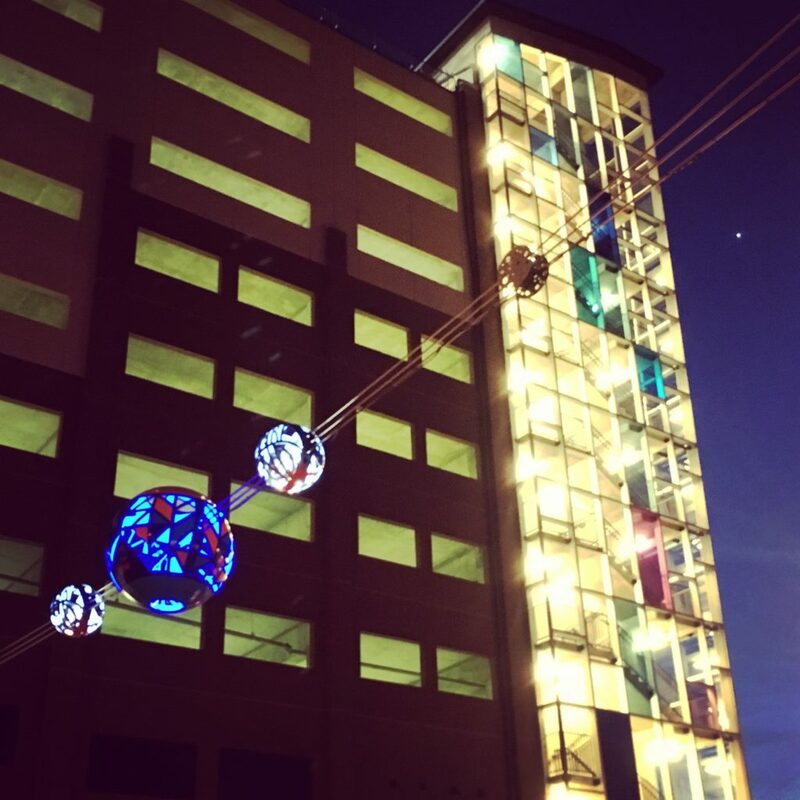 That’s certainly a more dynamic and exciting view of what art can accomplish for a city. Successful public art is compelling enough that people will swerve off their well-worn paths in order to experience it. This means art can bring to life an underused route through the city, attract customers to an overlooked collection of shops, or bridge the gap between people in separate communities. 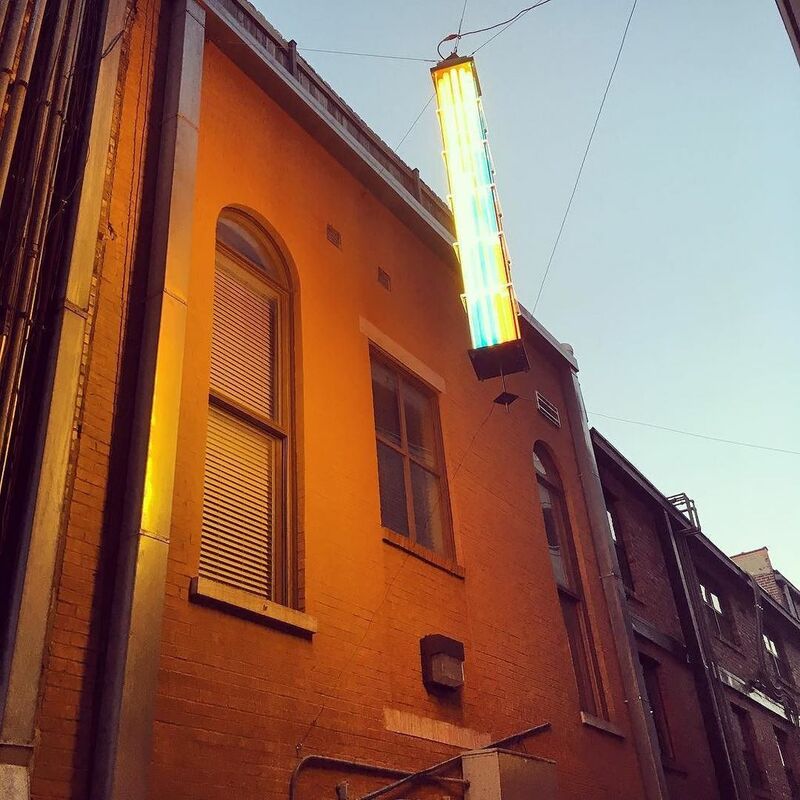 More and more, we’re seeing art used to enhance these physical connections and encourage people to discover something new about their world. 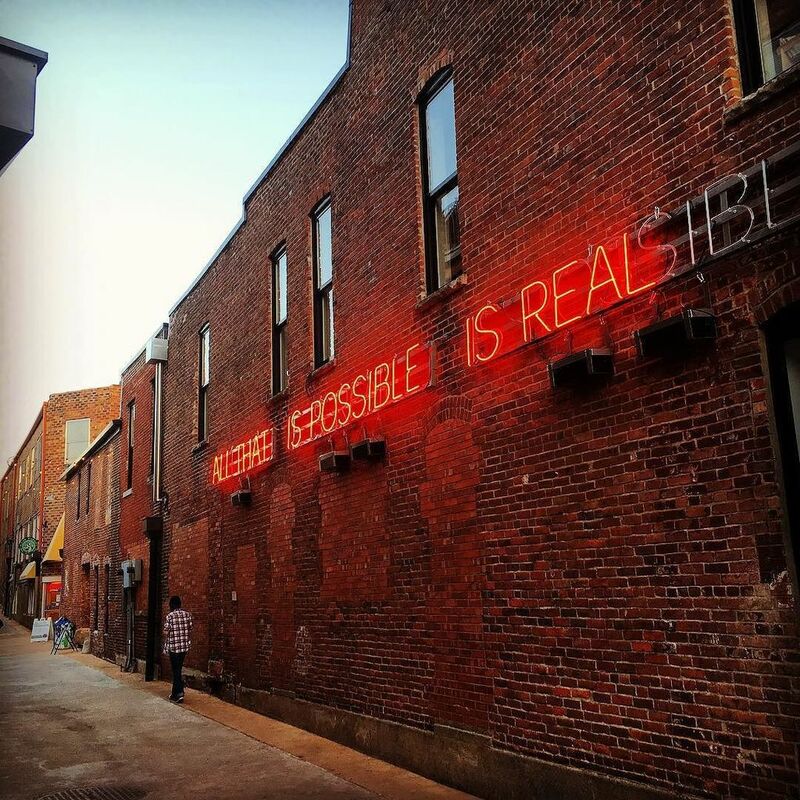 The True/False Film Festival, for instance, uses art installations to draw visitors down alleys commonly used by locals as shortcuts. 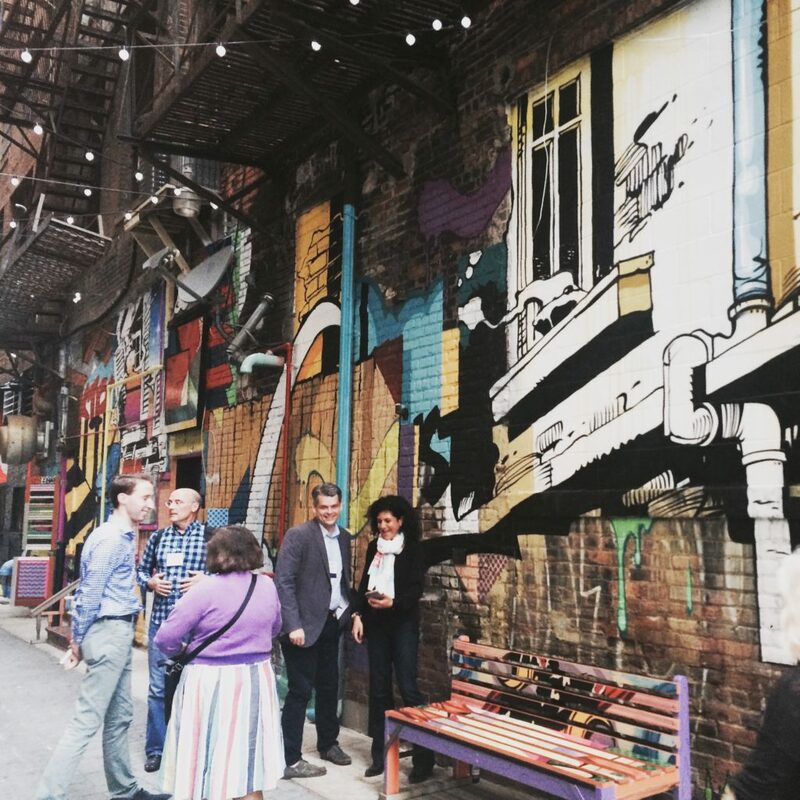 One alley in Detroit made this approach permanent, expanding the notion of what’s considered a gathering place with murals, benches, and revolving art exhibits. The District’s Light Hubs are located at entrance points to downtown as a way to entice visitors to explore just a little further; images of leaves and birds on the Fourth Street globes welcome cyclists and walkers off the MKT Nature Trail, while the iron and steel globes on Tenth Street near Columbia College remind us of an era when trails were rails and students travelled into town via the Wabash line. Art is also about creating a swerve in perspective. 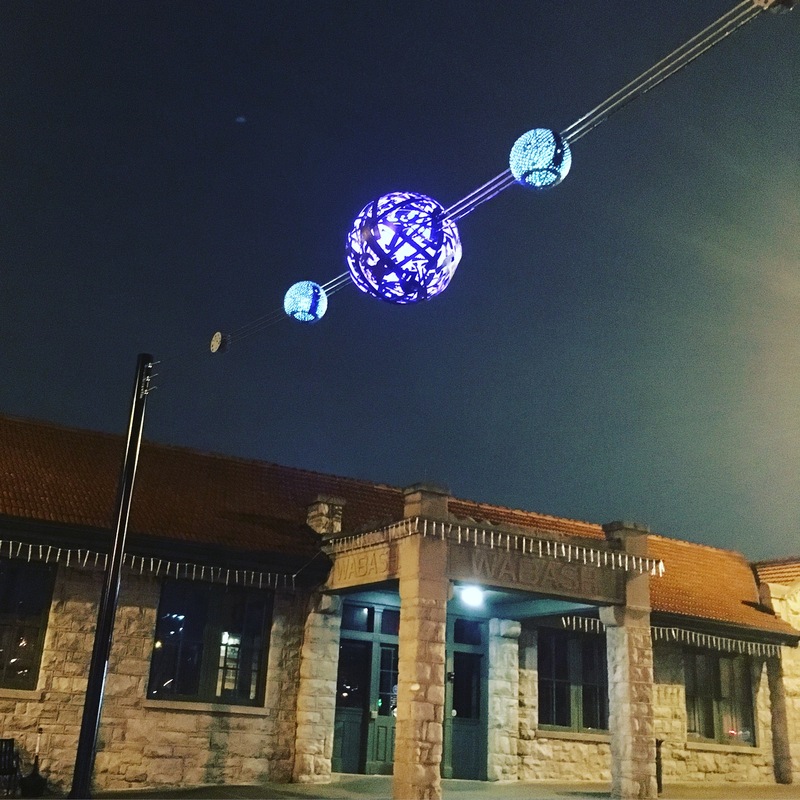 The Light Hub on Fifth Street commemorates Sharp End, Columbia’s historic African American neighborhood. The globes physically bridge the divide between the north and south sections of downtown, which were created by forced racial segregation — a divide so strong it was actually formalized in an old city plan. As we dart across the street today with relative ease, we reflect on how that once was not so simple for our citizens. The Business Loop has its own historical connections to celebrate. Historic Highway 40, as The Loop was once known, connected Kansas City and St. Louis. I-70 now serves as both a physical divide for our city and a gateway into it. Where we take that understanding will be the subject of much conversation as we begin the planning process for the corridor. Lyz Crane also stressed that art should be a thoughtful and integrated part of any planning process, and we intend to follow her advice. We look forward to discovering all the creative ways we might entice you to swerve from your regular route to visit us here on The Loop.